I have been paper crafting for a few years. From the very beginning, dies have been my go-to tools. Grab a die, some paper and a few minutes later you have a completed card or layout. So easy, fun and fast. 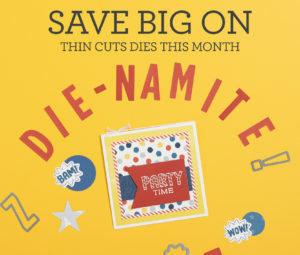 The CTMH March Die-Namite promotion is such a great price for Thin Cut Dies that you will use over and over again. Grab them before the end of March and they go back to regular price! Visit my website: maryabrooks.ctmh.com to see all the great dies at great prices.